Where are the Meibomian Glands? The meibomian glands run along the inner skin of the eyelids with their orifices situated between the eyelashes and and back edge of the eyelids. They are arranged vertically with 30-40 in the upper lid and 20-30 in the lower. Upon blinking, the force created causes expression of oil from the glands. This oil, or meibum, helps prevent evaporation of the thin tear layer and spilling of tears over the eyelid margins. It also interacts with the tear film to enhance the spread of tears by reducing surface tension. Meibomian Gland Dysfunction (MGD) is a condition where the glands that exist in the eyelid are not functioning correctly or are blocked. The purpose of the glands is to produce an oily secretion that prevents the evaporation of tears allowing the eye to remain moist. 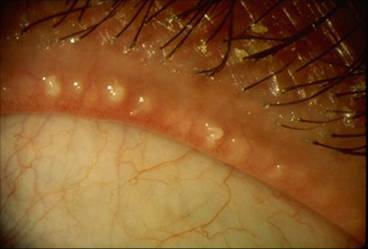 In patients with MGD the secretion is too solid and causes gritty, burning sensations and occasionally lumps on the eye lid. MGD is a relatively common problem (1 in 100 people have it). It is more common with age and can also be related to skin problems such as Rosacea. • Hot Compress – You can, run a basin of hot water and use a face cloth or flannel as a warm compress, Unfortunately wet flannels tend not to get hot enough or stay warm for long enough to be effective, and this is a real nuisance so people just don’t do it regularly. The eyebag is a much more effective way to treat MGD, it will get hot enough and retains the heat long enough to melt the mebium (oily fluid) pleasant and simple to use therefore you are much more likely to use it regularly and maintain treatment for your dry eyes. • Lid Massage – after heating the secretions need to be expressed. • Use of Artificial tears. As with all eye conditions speak to your optometrist for advice on the treatment most suited to your needs. Both Eyebags and Blephasol can be used in the treatment of Meibomian Gland Dysfunction. For the best advice arrange an appointment with our optometrist to have your eyes thoroughly assessed.